We’ve been diving into all of our commerce data from retailers and brands around the world… and the results are in! Our Global Commerce Review Map draws insights from marketers across regions, all of which demonstrate a steady year-over-year increase in smartphone usage. 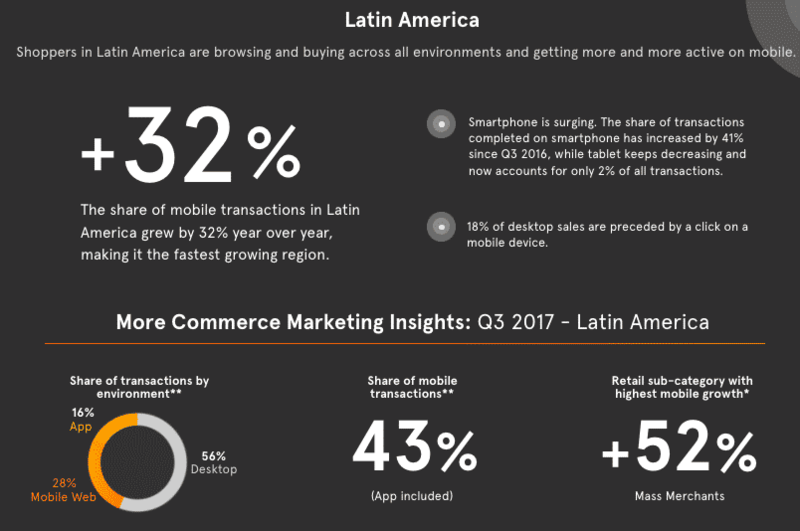 But Latin America leads the growth with a 32% increase of mobile transactions over last year. Including app transactions, 43% of all commerce transactions are via mobile, with transactions at mass merchants growing 52% over last year. 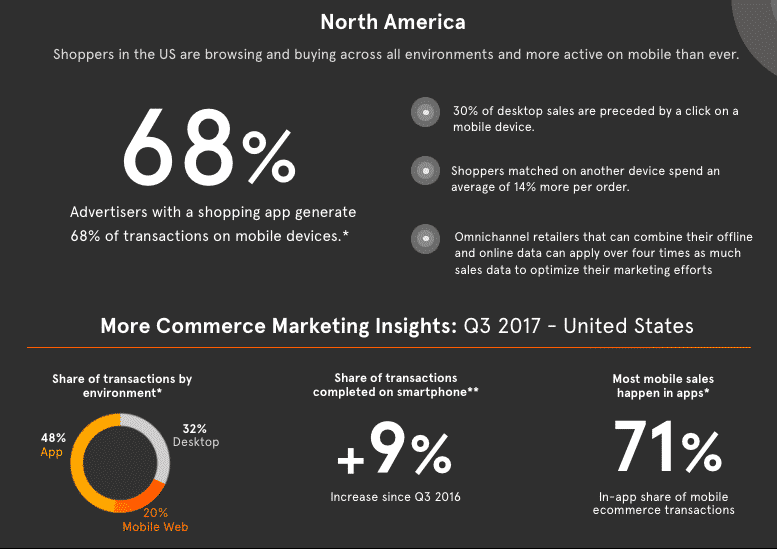 Shoppers in the US are more active on mobile than ever, browsing and buying across all environments, though less on desktop and tablets. Since Q3 2016, transactions completed on smartphones have increased 9%. And of all the mobile transactions, advertisers with a shopping app generate 68% of those transactions. Mobile usage may be on the rise, but it appears the tablet is falling out of favor as smartphones get bigger and better. In Europe, tablet transactions dropped 19% from the previous year, but even steeper is the 42% decrease observed in the Middle East and Africa. Across the globe in Latin America, tablet transactions account for just 2% of total transactions. Combing intent data lets you see more shopping dollars per shopper, meaning you have a better understanding of their shopper journey. In North America, matched shoppers spend on average 14% per order while in Europe they spend an average of 12% per order. 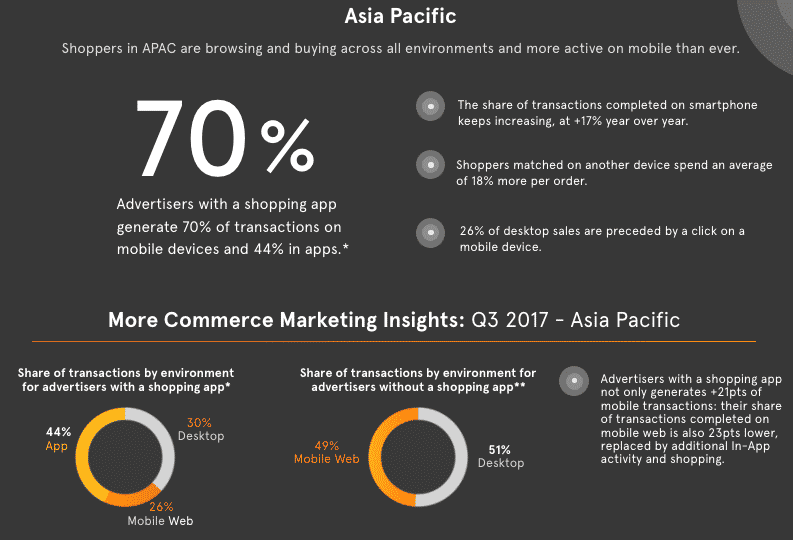 Matched shoppers in Asia Pacific however, lead by spending 18% more on average per order. It is indeed the era of the Omnishopper, not just in the U.S. but worldwide. With online retail sales likely to pass 1 trillion in 2027 in the U.S. alone, retailers need to tap into cross-device trends to take part in this growth. What’s clear is that as today’s shoppers shop more and more on-the-go, online and offline sales should be evaluated together to paint the whole picture of the shopper journey so marketers can improve campaign efficacy. 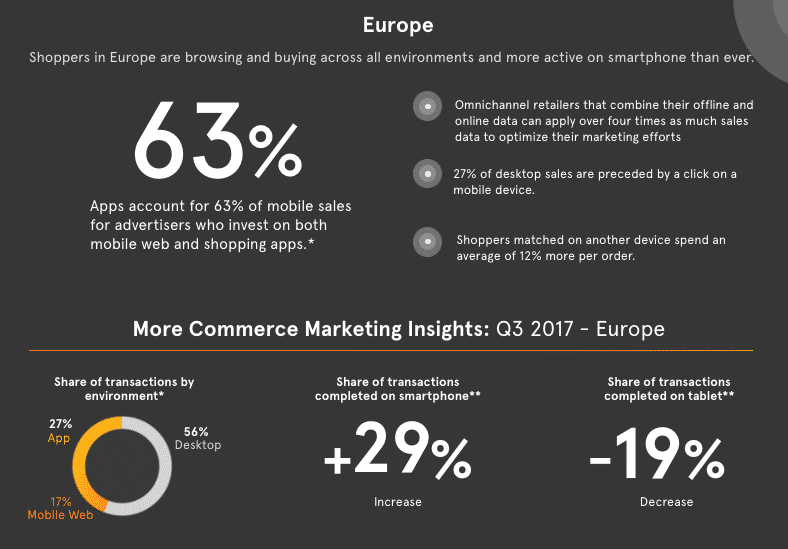 Criteo’s ongoing Global Commerce Reviews will shed light on useful cross-device trends that benefit brands and marketers alike and help you identify which you can implement into your future campaigns for immediate and future growth.